SAN DIEGO, Calif. (Dec. 6, 2018) – ElliptiGO Inc., the pioneer and world leader in stand up cycling, is celebrating the spirit of giving this holiday season with an opportunity to win the world’s most popular elliptical bike. Nominations are now being accepted for the Put A Bow On A GO contest, which features an unprecedented total prize value of more than $10,000. Four winners will each receive an ElliptiGO 8C bike. Entrants are asked to share a brief essay and a photo or video explaining who they think deserves to win and why. 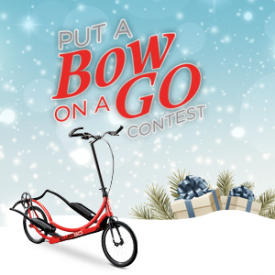 Nominate someone you care about from now until Jan. 6, 2019 at www.elliptigo.com/bow-on-go. Entrees should showcase how an ElliptiGO bike could help the nominee unwrap a spectacular new year. Nominees will be selected to win based on how they exemplify ElliptiGO’s core values of caring, inspiration, innovation, fun and integrity. Nominations can be shared on social media, where likes, comments and shares can help nominees get noticed. Winners will be contacted on Jan. 10, 2019. One of the most passionate members of the global ElliptiGO community made this contest possible. Tera Moody, a retired elite marathoner and ElliptiGO enthusiast, generously donated the bikes being given away in this contest and other upcoming promotions. For more information on ElliptiGO or to find a dealer, visit www.elliptigo.com.